Notes: You are a small high-tech firm specializing in integration of varied technologies for military purposes. CEO Jesse Lefler started the firm as an offshoot of a personal research firm, taking the business private as he focused on high-efficiency rocket engines for national defense purposes. Shortly thereafter, military regulations required significant robustness improvements in all their products. Lefler then hired Ornelas to apply his groundbreaking engineering skills to improving product robustness. Something was missing, however, and when the two realized they were making great products but losing money, they hired business manager Leighton Temple to take over the daily financial aspects of the business (and remind them to tie their shoes each day). Due to Ornefler LLP’s background in engines, all rocket engines are half price for the firm. Business Manager Temple has only been signed to a short-term contract, and is eligible to join any two-member team following his contracted release date of May 25th. Illustrations: Any other photographs or illustrations to help communicate your plan. I'm thinking you probably want to get some more details / background about HOW to maneuver into orbit. Play-by-Play: The rocket blasts off with tremendous power as the three solid fuel engines burn brightly. The rocket breaks apart as the engines are released and the next set takes over. Next the final set controls the descent as the cockpit hurtles back to Earth. The cockpit then parachutes down into the water nearby. Strategies / Project Timeline: Next we wish to pursue an orbital launch, which is the next milestone we wish to achieve. We don't need to start over, but some improvements are in order. We will need to calculate the thrust to achieve orbit. Design Goals: Our spacecraft was designed in order to reach stable orbit with one Kerbal inside, and then return to Earth in the Ocean. Thus, we had multiple stages of booster rockets and solid and liquid fuel engines to reach orbit. 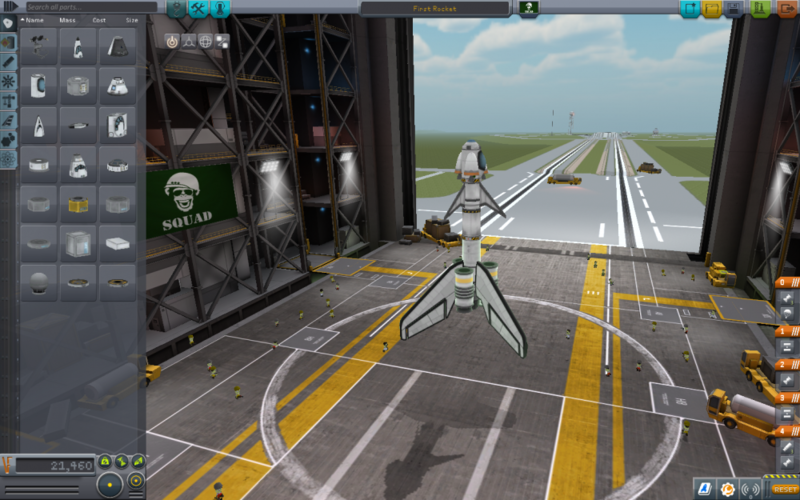 Then, we added small boosters to perfect the orbit, and a parachute and air brakes for landing. Launch Goal: We wanted to reach orbit, both manned and stable milestones. 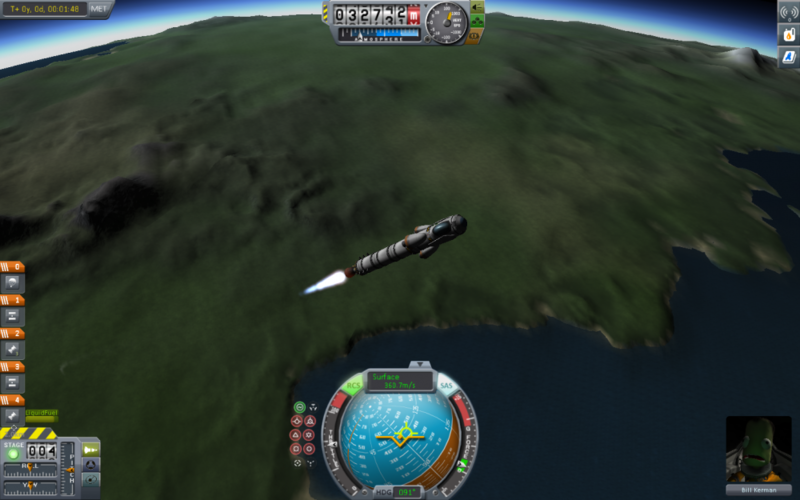 We demonstrated that with the correct arrangement of liquid and solid fuel, Kerbals can orbit their home planet for two days. Pilot Plan: The pilot has to keep the rocket straight with the solid fuel up until about 1,000 km. Then, he will angle the ship slightly, at maybe a 25 degree angle about, and head east to match the planet Kerbin's rotation. He will then shift to about 45 degree angle after the solid fuel has been used up, or close to. He will keep at this angle on the first liquid fuel engine, then switch to a steeper angle with the second liquid fuel engine, almost 90 degrees. 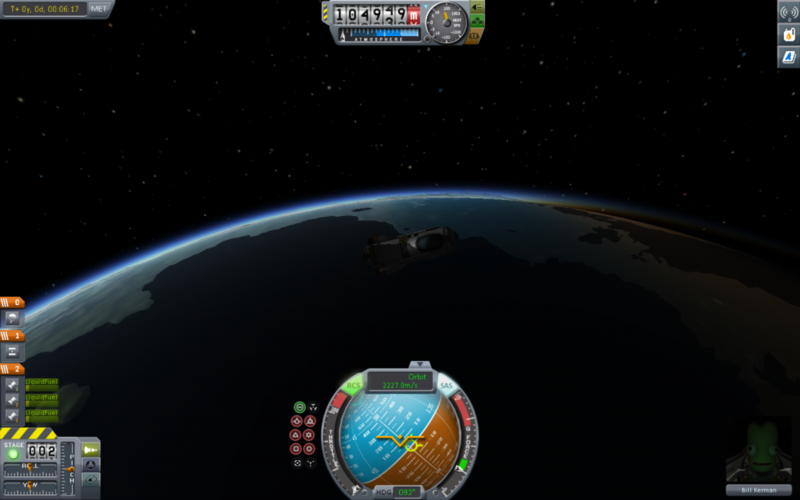 Next he will use the mini thrusters to perfect the orbit and leave it, finally deploying the parachute as he lands. Play-by-Play: The solid fuel boosters activate and the rocket is propelled in the sky near immediately. The craft begins to tilt as it leaves the heaviest part of the atmosphere, heading due east. It continues to angle as it reaches farther and farther into the sky. Eventually the solid fuel boosters detach and fall back to Kerbin, meanwhile the liquid fuel boosters activate and begin to maintain the craft's momentum at low output. As it runs to half fuel the output level is increased, and eventually the Rapier engine detaches as well. Now the ship pauses, aligning itself and waiting to fire. The second liquid fuel engines begin a slow burn, maintaining a medium output. As the ship angles more and more, the flight crew monitors the orbital path to ensure that they stay on track. Soon the liquid fuel engines are nearly used up, and the crew is well above the atmosphere at about 80,000 km. The liquid fuel detaches, and the ship is angled a perfect 90 degrees due east. The small external rocket boosters on the cockpit are all that's left to aim the ship, making minute puffs to create a stable orbit. After a few days in space without food or water, the pilot angles west and uses the last of the remaining fuel to counteract the ship's velocity and allow gravity to begin their descent. As they fall, they activate the air brakes to slow their velocity, and eventually end with the parachute safely landing them dead center in the ocean. may god help that pilot. Summary: We achieved a stable, manned orbit. We struggled a bit with overheating as the rocket reentered the atmosphere, but we believe having more rockets to slow descent will greatly help reduce this threat. We also took a while to figure out how the airbrakes worked, so next time we'll actually use those to maximum efficiency. Opportunities / Learnings: Having lots of liquid fuel to angle and move in space is most important. Solid fuel is only good for sending a ship out of the atmosphere, after that, liquid fuel is most important by far. Small rockets for angling is also very important for space missions. Strategies / Project Timeline: Next we need to measure how much fuel it will take to reach Mun or Minmus. Then, the milestone of landing and orbiting those two bodies are our next goals in mind. Design Goals: This ship was meant to travel from Kerbin to Mun in a mainly straight path. With this in mind we placed lots of fuel in asparagus staging and the largest solid fuel boosters possible to exit the atmosphere. We also kept our rocket very light to increase the thrust to weight ratio. Launch Goal: We hope to achieve the Mun orbit achievement or at the very least figure out how far we have to angle in order to successfully intercept the Mun. Pilot Plan: The pilot must activate the solid fuel boosters and travel straight up until they run out. He will then use the liquid fuel boosters to stay at about 200 m/s within 70,000 m, then allow it to raise steadily to about 400 m/s during the space mission, then angle slowly and ride steady until he reaches Mun. 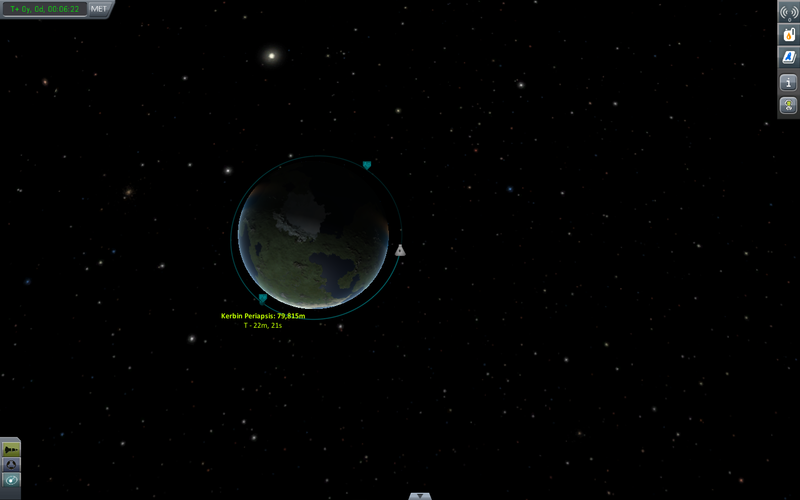 Then microadjust to reach orbit, and return to Kerbin, all the while detaching all used fuel tanks. Play-by-Play: The rocket begins to ascend as the solid fuel boosters activate. It flies straight upwards until about 40,000. The solid fuel boosters detach and the liquid fuel activates. The liquid is kept minimal until the velocity slows to about 200 m/s, then keeps it constant at this value. It continues to fly straight up until about 70,000 when it angles slightly West and raises its liquid output. The rocket begins to slowly gain velocity until about 550 m/s when the liquid fuel ends. 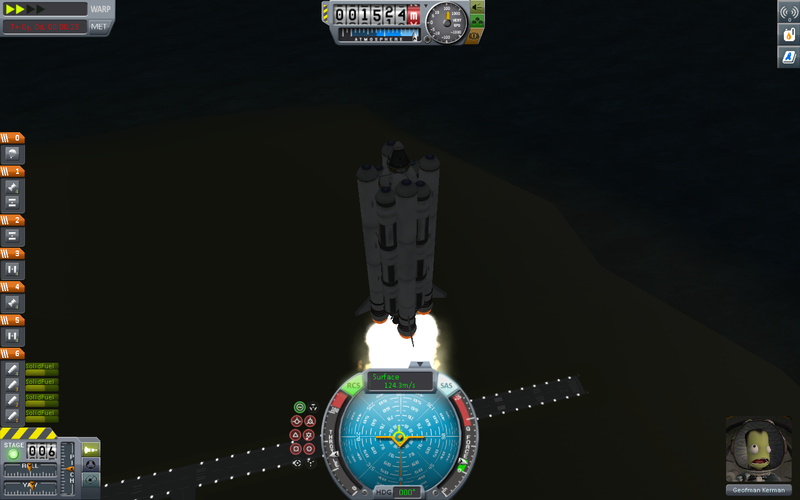 At this point we realized we would be reverting the flight due to its failure to reach Mun, so we detached the rest of the rocket and used the liquid fuel to propel ourselves into orbit around the star. Summary: We proved that we can reach Mun with our rocket, so long as we perform better on the actual flying. 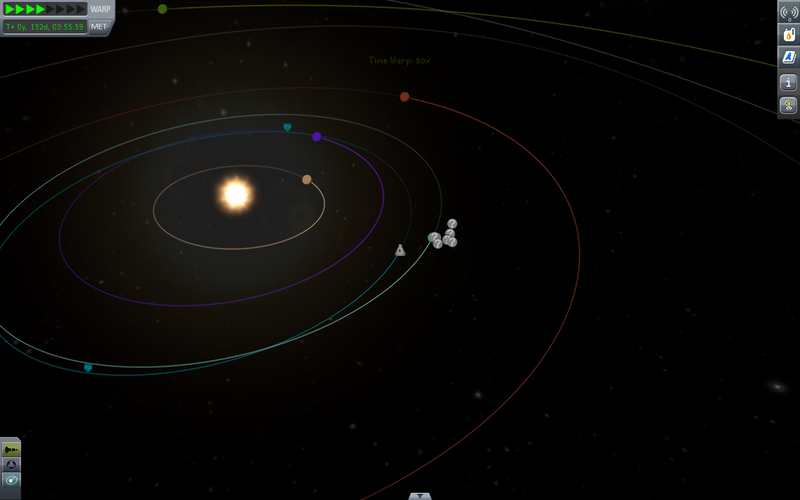 We also learned that the angle to reach Mun is greater than the one provided by Kerbin’s rotation. Thus we have to angle it farther West for next time. Opportunities / Learnings: The angle we needed for the launch and that our fuel tanks were enough to get us to Mun and hopefully back safely. Strategies / Project Timeline: On our next launch we intend to use the same rocket to actually reach Mun and orbit and return. All we have to do is perfect our flying.